At the heart of Cambridge boutique Elegant Atelier is the belief that contemporary style and classic tailoring can comfortably co-exist. Owner Sinead chose the name "Atelier", meaning an artisan's workshop or studio, as she felt it epitomised the boutique's philosophy of showcasing expressive, creative, and authentic work. Their collection offers exquisite details, beautiful fabrics, and contemporary cuts with vintage-inspired finishes. 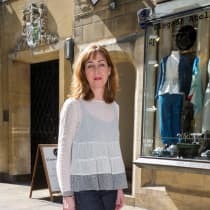 "As a small niche independent store the time and cost of launching online on our own was a bit scary, but through Trouva we have been able to grow our business and tap into a much wider audience of loyal followers!"